JLS didn't have one of these. OK, it's not exactly an Eigenharp, but the Heath Robinson instrument played by Lady GaGa at the Brit Awards last night at least provided the ceremony with a talking point. 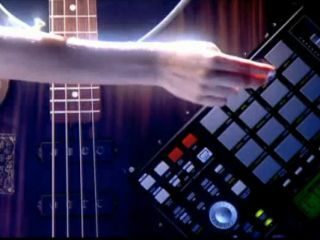 The 'GaGa guitar', as it will inevitably come to be known, appears to comprise an upright bass with a MIDI controller keyboard and Akai MPC1000 bolted onto the front. Lady GaGa used it to trigger samples during her performance of Dance In The Dark, which you can watch in the second half of the above video. You wouldn't exactly call it a shocking moment, but it surely left some of the audience bewildered. And at the Brits 2010, bewildering was about as good as it got.